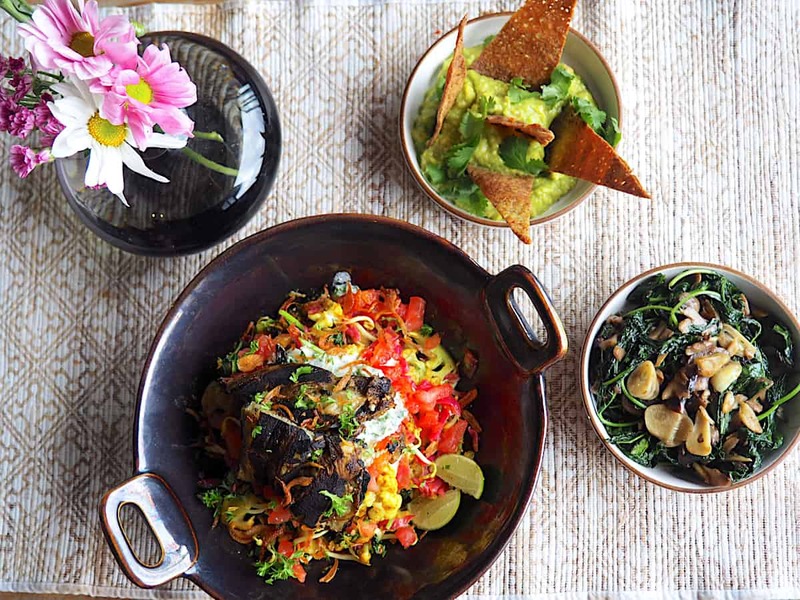 It’s unbelievable how many vegan and vegetarian restaurants there are in Ubud….From inexpensive local warungs to let’s splurge and go Michelin-rated fancy baby! Either way, your taste buds will be tantalized and your soul nourished. As I write this I’m a little giddy with excitement to share this with you! I’ve narrowed my list to twenty-two of my favorite places for you to enjoy. I’ve included my favorite vegan and vegetarian dishes to try AND I’ve also duly noted places that serve cocktails, glass of wine or perhaps a coconut milk latte’ and as if you didn’t already love me for this list I’ve let you know where you can tap into some wifi should you need to say hi to friends back home or get some work done. Furthermore, if you are staying at a place in Ubud with a kitchen I’ve provided information to find local organic markets and grocery stores. 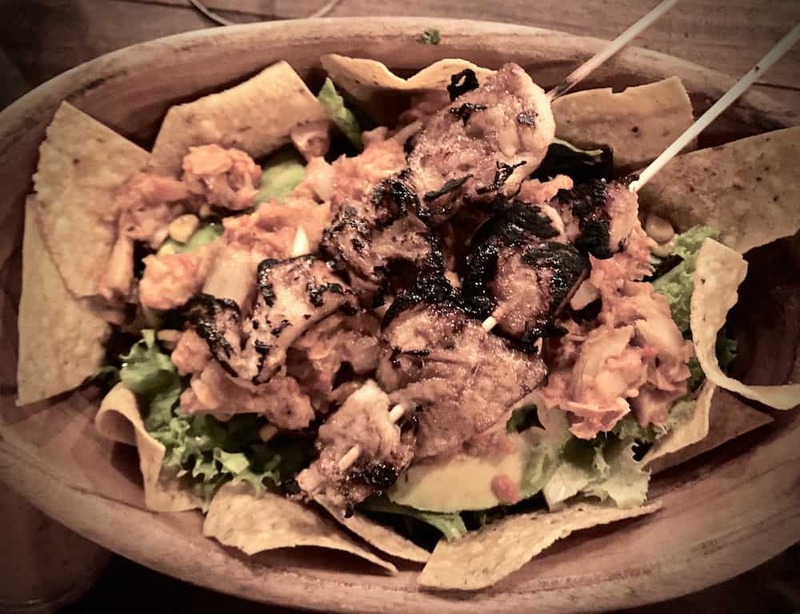 After all, I want healthy eating to be accessible and easy for you while you are in Ubud. PLUS: My favorite dishes to try! White, bright and open with plenty of seating. A digital nomad favorite spot. Raw Menu. Great place for breakfast, juices, coffee. Build your own smoothie bowls. If you like raw desserts there are plenty to choose from. √ Alchemy also offers raw cooking classes! If you are a breakfast person…this is a popular spot! Back tables have a beautiful view of the rice fields. The menu is plentiful. Rainbow Crystal Shop is located inside the restaurant with some fun items to peruse as well. √ Mexican burrito kidney beans with Parsley and lime. (ask for rice on the side to make it even healthier. √ Vegetarian green curry. Although I still think Thailand makes a better curry than Indonesia, this dish is a staple diet for me on a colder rainy day in Ubud. Very hearty and tasty. One of the most stunning eco-resorts I’ve seen. Great place to sit on their deck and settle into a bean bag chair and watch a sunset. It’s also one of the few places I’ve found that I can find a decent glass of imported red wine for around $10 – $17/ glass. Be sure to take the elevator down to the jungle floor and walk around for an hour or better yet find out when they have another one of their Sunday Funday brunches for an unforgettable experience. You’ll feel like a magic fairy in a mystical garden of Alice and Wonderland. River flowing by, surrounded by natural pools and bamboo architecture structures built into the mountainside with swinging lazy bamboo chairs to pass the time with a good book. This is a place also worth staying if your budget permits! Enter into the giant circular wood carved doors depicting Indonesia culture and get excited about what’s to come at the dinner table. Open modern design. Sounds of water fountains. A menu that brags to have different dishes from around the globe ensures that no guest will have trouble finding something good to eat. Be sure to go upstairs and see the quote of the day in flowers (for instance, “Eternity is Now” and slide down the fire escape for kid like giggles. 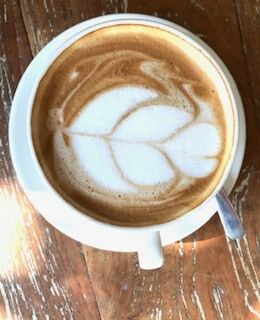 Head here for your morning java or organic tea, pressed juice or head in the afternoon/evening and enjoy a picturesque view of the jungle with a really tasty menu. The atmosphere is cozy and comfortable. The menu covers something for everyone: smoothie bowls, burgers, crumbed eggplant and salads. √ Caramelized Onion, mushroom and chili pizza on a gluten-free thin crust. Oh yeah! √ Roasted Vegetables. Worth the wait, slow roasted veggies in their wood-fired oven cooked to perfection. Healthy food made in a conscious and sustainable manner. Part of the slow food movement with 100% vegetarian meals, Vegan and Gluten Free. Their ecological philosophy. Dumbo’s sister restaurant, Elephant, is actually my preferred go-to spot. They make an amazing grilled veggie dish if you don’t mind waiting for it. Their motto is, “With our ears to the Earth, we are here to fill your life with flavors and to nourish your soul with an array of the best locally grown tasty fruits, shoots, and roots….to bring this little zesy sparkle that will light your day and feed your emotions…” How perfect does THAT sound?! The first floor is a beautiful bar where you can pick an oldie but goodie album and listen while you enjoy the hip atmosphere. We listening to the Beatles album during our last visit. Be sure to check out the movie listings at their vegan organic cinema, Paradiso which shows a various array of films for 50,000 IDR / US $3.54 which can be applied to your dinner! They also started having Indigenous Film Nights so be sure to get on David Metcalf’s email list to not only get invites for that event but for the plethora of rich cultural events around Bali and beyond that David often shares with his community! Whenever you see a sign that says “warung” that means “local” so, If you are on a budget or just want to try a local flare, Garasi Warung is one of my favorites. All the dishes range from 15-25,000 IDR / $US 1.00 – $1.65. Want to travel more comfortably and consciously…? SEE all my favorite healthy travel essentials including E-books, Electronics, Supplements, Gear & MORE! My favorite gluten free vegan dessert: chocolate brownie. Normally gluten free for me means ‘BLAGHH dirt! But this owner has figured out how to make gluten free taste great and if you happen to catch her in the shop ask her if she’ll sell you some of her gluten free pancake batter to cook pancakes for the family! You can also order gluten free bread for take away the next day. BEST ‘fake’ meat skewers I’ve EVER had! When I’m looking for nice ambience and great vegetarian food options I vote for Kismet. Small four-person bar upstairs and several tables in a soft dimly lite room. Quick service is not the norm in Bali but if you pull the light string located above your table a red bulb illuminates and your waiter quickly arrives. Kismet has the best fake meat skewers in Bali. If you’ve ever wanted to try to give up meat your gonna freak out how good these skewers are! Trust me. You won’t regret coming here. Red wine and full bar options. My favorite Kismet Cocktail: 24 carrot cooler – fresh carrot juice, vodka, cinnamon, honey, chili & lime. It has the perfect spicy kick! √ 666 Southwest: marinated jackfruit, corn, avocado tartare, red peppers and corn chips. 🥑Wanna eat for just a few dollars? Here’s a local spot to go to. Farmers Market 10 AM – 2PM BYOB – Bring your own Bags! Head to the town to Penestanan to enjoy farm to table organic dining. If your a raw foodie and appreciate a well-trained chef you won’t be disappointed coming to Moksa. Interesting fresh organic dishes and deserts. —> I also recommend their cooking classes! An award-winning French Inspired Balinese food. I prefer the garden setting. Call in advance and ask for a 6-8 course vegan tasting! For approximately 1,000,000 IDR per person (US$ $75). You will certainly enjoy a decadent memorable experience. With only a few tables to choose from this uber quaint eatery has a great modern urban vibe with chill tropical house music. Check out the AC room with soft sand to run your toes through while you eat. The atmosphere isn’t special but the Indian flavors are mouthwatering. √ Navratan Jalfrezi ~ green beans, red pepper, paneer, peas, chili, coriander cumin and a dash of yummy! One of the best vegan spots in town. Head hear through a side passageway through monkey forest to get here faster if you don’t mind scootering along narrow streets. Menu is diverse and everything is tasty. Pizza, Bowls, Wraps galore. Diverse and tasty menu. Cozy atmosphere with dim lighting and comfortable. Usually a little hot. A must to go! 🥑 My favorites: Mung bean burger + Vegan chocolate chip cookies = Pure Joy! If you have the time I love walking to Sari Organic through the rice fields to enjoy this quaint cafe with views of the rice fields. From the main road it will take less than one hour. 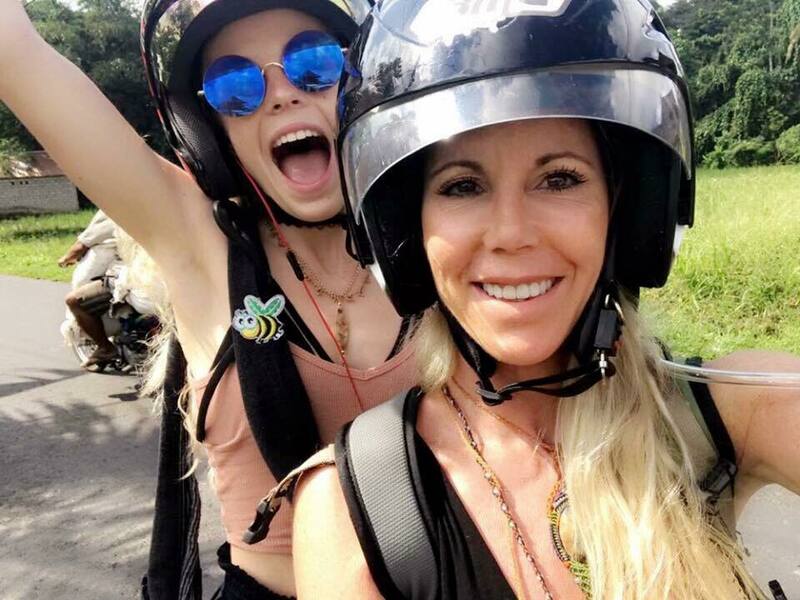 You can also ride a scooter if you your feeling daring but as they often say in Bali, “hati hati” (go slowly) the road is extremely narrow and if your not careful you’ll wind up in a rice field. Motto: The Sayuri Zen Logo stands for “the source or essence, nothingness, is the infinity & the whole universe, that everything is interconnected in a chain of co-becoming and in a state of constant flow. 100% plant-based vegan, high vibe food, mostly raw & gluten free, ethically and organically sourced when possible. 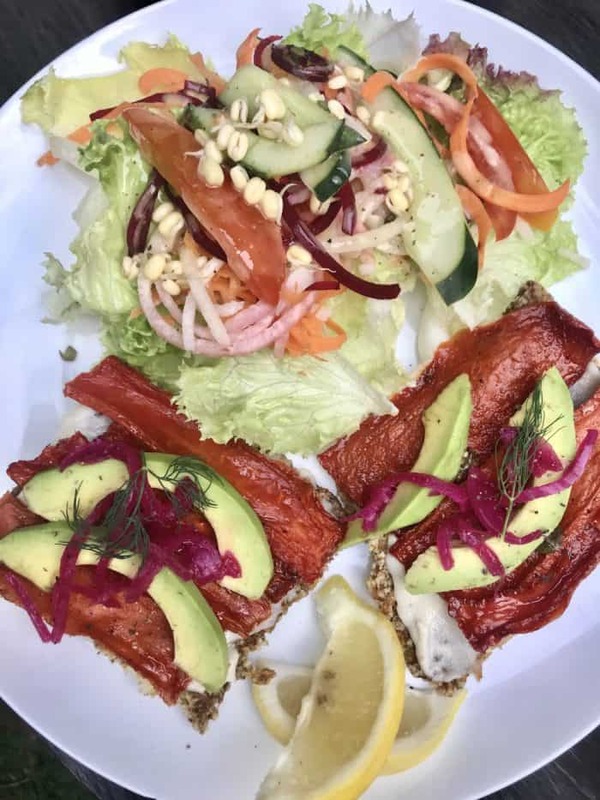 √ Grava lax (dried papaya that tastes like salmon) or the Reuben Sandwich (avocado cashew pesto eggplant steak sauerkraut served with coconut chips). The atmosphere is a bit hot and stuffy but the food never disappoints and there are few spots to sit outside on some cushions. Wifi is decent and you can work there a bit as well. –>Raw Food, Desserts and Chocolate Training classes. √ Vegan buffett (Huge array of vegan options) for approx 50,000 IDR / US$ 3.50 . Back table has a garden view. Beautiful clean open and modern. A nomad favorite spot because the wifi is decent so the place is often littered with wanderlust people feverishly working away over a hot latte and a moringa pineapple juice. Menu is eclectic and interesting. √ Bombay Boom – Cauliflower mushroom crunchy sprouts and warm Indian spices like cumin and turmeric topped with creamy cucumber raita and fire roasted eggplant. I hope your taste buds will be tantalized and your soul fulfilled with my 22 favorite Vegetarian hot spots! E-books, Electronics, Supplements, Gear & MORE! If you have a kitchen and want to cook the key is to go to the local markets in Ubud from about 5am-8am and get all your produce. A bunch of bananas will cost you about .75 cents, a small green mango .45 cents, $1.00 for very large papaya. If you are feeling brave try a Durian, if you can get passed the pungent smell! Now, let’s get back to eating healthy! 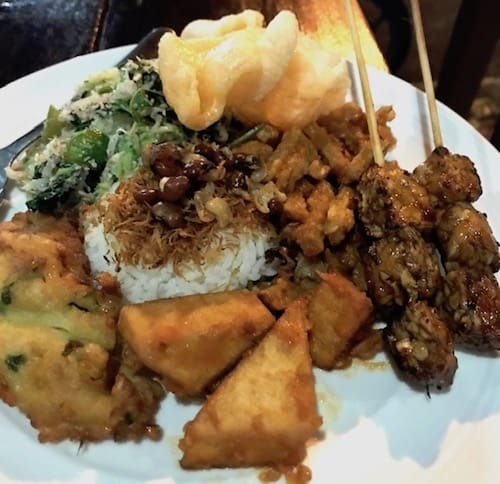 It’s really so fun to eat out in Ubud and if you’ve ever thought about going Vegan or Vegetarian it’s never been easier living in Ubud. Below I’ve provided everything from local markets, grocery stores and of course a list of my top Vegan / Vegetarian restaurants that are ALL worth checking out. Bon Appetit! 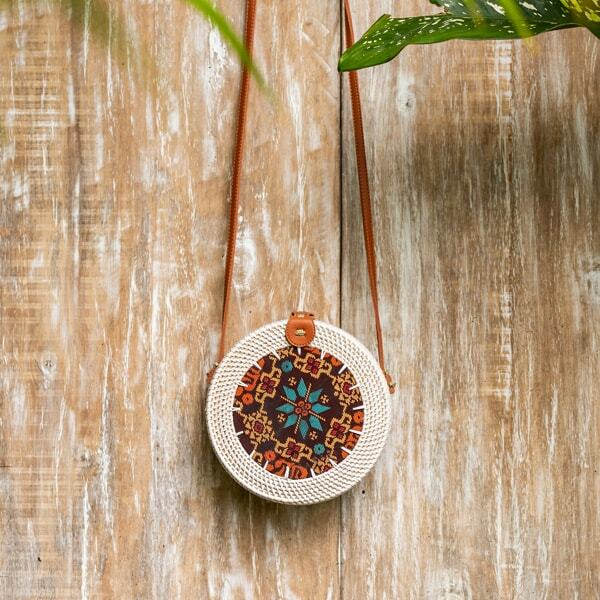 Where are the Best Markets & Supermarkets in Ubud? If you need to get to a market there are three large supermarkets that have everything you need. Including alcohol and household items. Because one of my visits I was staying for 8 months I bought a blender and juicer at Delta Dewata so I could enjoy one of Zoe’s smoothie bowls topped with granola every morning! Although Bali Buda has the best gluten free granola…we started making our own. I’ll share the recipe with you. This shop has a great array of some produce, gluten-free bread and supplements. Be sure to try the Vegan chocolate mousse. OMG! Incredible. ***Get Balian 5 gallon water from Bali Buda, better water quality than what’s available in the stores. They also deliver. Cost is US$2.25 for 19 litres + .37 cents for delivery. More high end boutique grocery store. What’s your favorite Vegetarian place? I’d love to know! Be sure to subscribe to my blog for more healthy travel tips and links to conscious travel products.